We have become a culture that defined by what we record on a digital device. I remember hearing an alarming statistic a few years back wherein something tragic happens, a bystander is more likely to record it then attempt to help the situation. Granted, this is a few years old, so it may have changed slightly, but somehow I can't believe that. There are more crazy videos on our news programs and on Youtube then we can ever fathom to imagine. What draws people to seeing the unthinkable, and better question, why do we do nothing to help it. The answer, according to Dan Gilroy's "Nightcrawler" is that people feed on this type of content. Spectators get an adrenaline shot through their bodies when something extremely hazardous happens right in front of them, that we feel the need to record, sometimes for the ego, other times for the profit. Lou Bloom captures this content for profit, Bloom is played by Jake Gyllenhaal who is having the most incredible year of his entire career. Between this and "Enemy," Gyllenhaal has more than enough to be proud of. When we meet Lou Bloom as the film opens, it seems he is at a crossroads. It seems his profession is a freelance entrepreneur, not sure what he wants to do with his life and he will settle with whatever sticks. It is clear that Bloom is a night owl, and he looks for work at night. After some time of searching, he seems to like nightcrawling. This means the paparazzi who take videos for news stories, and then those videographers get paid for the content they sell to these news companies. He soon learns that he is very good at getting this unbelievable footage for one particular news company run by Nina (Rene Russo). He soon realizes how good he is, and he will do whatever in his power to get the absolute best footage for Nina's news company. I hear many people complain all the time that Hollywood seems to have run out of original ideas. Sometimes, I have to laugh at this sentiment, because honestly, when has anything ever been original? Not for thousands and thousands of years. Even the movies that are top in the AFI 100 list, hail from plays, novels or real life. Originality really can't exist, because nearly each subject has been examined already. What we can do is put a fresh spin on what is already out there. I think Dan Gilroy puts a fresh spin on the investigation movie as well as the journalism thriller movie. Movies like this are rarely made and I was definitely taken aback by how mesmerizing the drama was in this movie. There is a great scene at the end of the film where Bloom sets up two murder suspects to be taken in by the cops, and the build up to the scene is superb. Quite possibly some of the best build up you will see in a theater this year. 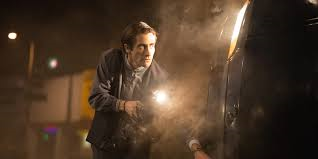 There are so many scenes like this in "Nightcrawler" that it is hard to discuss all of them in one review. Like I said above, Gyllenhaal is having a wonderful year. I know I never got around to discussing "Enemy" a second time, but it will still place high on my end-of-the-year list in a few weeks. "Nightcrawler" and Lou Bloom is all something he should be proud of. Lou Bloom is a relenting creation, someone who doesn't like people, someone who is places career above all else. Somebody who knows how to talk and can get themselves out of any situation, all while coming off completely innocent. These are not things any actor can do, and Gyllenhaal makes a bold statement with his performance here. I also have to give lots of kudos to Rene Russo who does a good job playing off of Gyllenhaal throughout the film. I love that Bill Paxton shows up to play a prick competitor, something he never fails at. Yet, this review would not be complete without giving special praise to Riz Ahmed, who plays Rick. Rick becomes Lou's assistant, and Rick butts heads with Lou pretty much throughout the movie. Their chemistry is impeccable, and I really identified with Rick quite a bit. I hope this movie only opens more bizarre and healthy doors for Gyllenhaal. I hope whatever Gilroy does next follows with the same intensity, and the same drama that fueled "Nightcrawler." It's not commonplace for a movie to keep me on the edge of my seat for most of the movie. "Nightcrawler" never allows you to relax, and its headlined by masterful performances.